· Objects slow down in the presence of friction or air resistance. 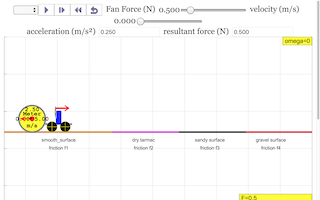 · Students can visualise how motion is affected when Fnet > friction, when Fnet = friction and when Fnet < friction, while the cart remains in motion. · Students learn how to predict motion given the magnitude and direction of Fnet with relation to the direction of motion. https://www.youtube.com/watch?v=vrgKspCxN4E by ETDtogo explains why the simulation fan produces a (point to the right) forward force. In the YouTube video, the cart moves to the left because the exhaust gases from the fire extinguisher pushes to the right.